I just got word that Nikon will produce an imaged-stabilized version of the vernerable EDG Fieldscope. There will be straight and angled 85mm models, each equipped with Nikon's VR (vibration reduction) technology that has been perfected in their stabilized camera lenses. I swear by the VR in my 200-400mm f/4 VR Nikon camera lens- it makes hand-holding the rig a reality, even with a 1.4X teleconverter. 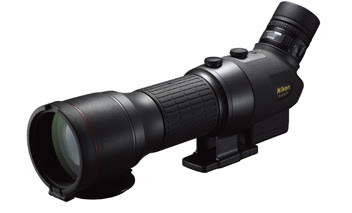 I think the potential for VR in a scope is pretty amazing, particularly for digiscoping. Using stabilized cameras for digiscoping really doesn't help since they can't counter movements in the scope, so this should be a major weapon for getting sharp digiscoped shots. I'm not sure when I'll get to put my hands on one of these but I'll let you know what I think when I do! !